The Moon has been worshiped and admired ever since the dawn of man. It has featured in artworks from time immemorial, and from cave paintings to Van Gogh’s Starry Night mankind has attempted to capture the Moon and the heavens in a fixed medium. Modern man has the camera, and indeed hardly anyone in the developed world today is not without a camera 24 hours a day in the form of smart phone cameras. More serious aspiring photographers will employ a more feature rich point and shoot camera, or even a DSLR with an assortment of interchangeable lenses. It takes a startling little amount of focal length/magnification to bring out lunar features such as the Maria, lunar rays, and the abundance of craters. The best time to shoot the Moon is not when it is full, but at any time less than full when the sunlight is grazing along these features causing the shadows to bring out these details in sharp relief. My favorite is anytime between first quarter and the waxing gibbous moon as it approaches Full Moon. It is already high in the sky by the time it gets dark and you get all the best features of the Moon at once. Superb crater and terrain detail along the terminator, but the more direct overhead sun on the limb brings out the ray systems around the craters showing the debris scattered from their formation. If you want to catch the Moon rising with some interesting landscape features, between New Moon and Full Moon is best as once you get past Full Moon it starts to rise later and later every night. Don’t forget too that only the New Moon is not visible during some time of the day. After Full Moon, the moon is visible for longer and longer each morning in the blue sky and can also make for interesting compositions. This is also true after New Moon but the time the Moon spends in the blue sky grows shorter and shorter until at Full Moon when it rises in the sky opposite the setting Sun. Photographing the Moon is possible with any camera you own, but you may need a couple of other accessories to help you out. We will start with the cell phone. Cell phone cameras are amazing in their capabilities, and feature fast wide-angle lenses, and often have sophisticated intelligence built in for low light photography. Unfortunately, none of this helps with photographing the Moon. In order to expose a night time scene that features the Moon, these cameras will typically over expose the Moon in order to try and bring out the darker foreground. In addition, the Moon is much smaller in the sky than your brain interprets in, and often looks like a really bright over exposed star more so than the Moon. You can attempt to zoom in on the Moon, or adjust the exposure time yourself, but it is virtually impossible to take a hand-held photo of the Moon with a cell phone… unless, you have a telescope. Any telescope will do in fact, even that old clunker you got for Christmas years ago that is hiding deep in your closet or the back of your garage. Drag it out and point it at the Moon. Pop in one of the eyepieces and focus by eye. You can actually hold your cell phone up to the eyepiece, adjust focus (of your cell phone) and exposure and take a photo directly. This is possible because a telescopes main job is not so much to magnify objects in the sky as to collect more light than your naked eye. All this light lets your cell phone take a very fast exposure with very little motion blur from your movement. I will warn you, this is tricky and takes some practice. I find when I do my public observing programs kids are often better at this than adults, and I think the reason is that the kids are more accustomed to playing video games! The trick is to line the phones camera up nice and flush with the eyepiece and centered perfectly. Most eyepieces have a rubber lip on them and you can rest the phone against that to help keep the camera straight. Holding the camera here with one hand, you then can tweak exposure/focus using the other and SNAP… you are an astrophotographer! If you really want to get serious with this method, you can purchase a smart phone to eyepiece adapter, such as this one made by Tele Vue that will hold the camera perfectly still and aligned in front of the eyepiece. 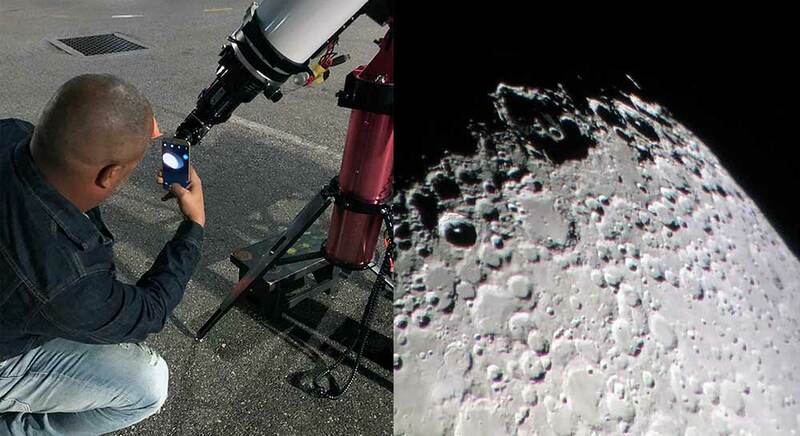 If you don’t have a telescope, or you want to use a better camera, then we need to up our game slightly. You will need at the least a point and shoot camera or DSLR, and you will need a tripod. You do not need an expensive tripod, one from a department store rather than a specialty shop will still do a much better job at holding your camera still than you can. Once your camera is on a tripod, you can point it at the moon, and zoom in as much as your cameras’ zoom or the focal length of your lens will allow. The biggest hurdle now is to keep your camera from shaking during the exposure. 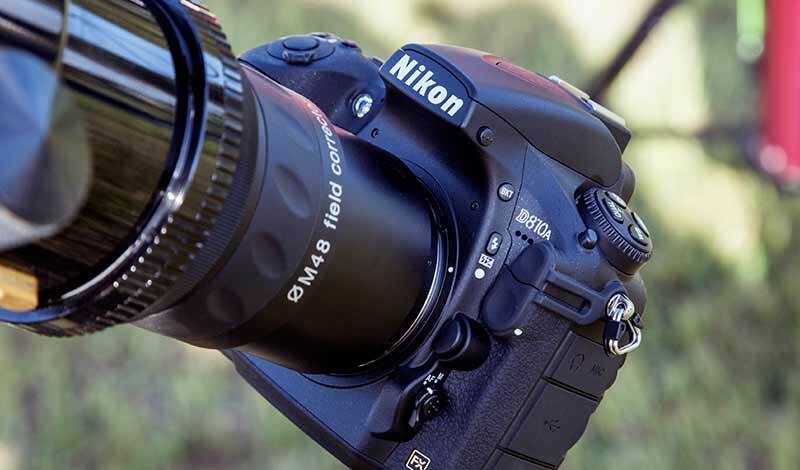 At large magnifications (long focal lengths), camera shake is amplified tremendously and great care must be taken, else you will get blurred images (image stabilization is little help at these extreme focal lengths as well). Rather than purchase an accessory to remote fire your camera (just you pushing the button to open the shutter is moving the camera), you can set your camera for a delayed shot. Most cameras will allow you to press the exposure button, and will then wait for up to 10 seconds before actually taking the photo. This gives any vibrations from your touching the camera plenty of time to die down. If you are using a full DSLR, the internal mirror flipping up also introduces some shake. In these cameras, you can search the menu and find a feature called “Mirror Lock”. When enabled, one press flips up the camera mirror box, and the second press will activate your delayed timer. An alternative to this is to put these cameras in video or “Live View” mode. When in live view mode, the mirror box is held up and exposures are simply taken right away. 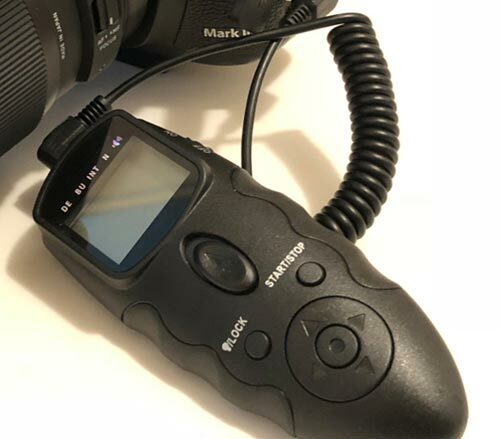 For this you may need to purchase an intervalometer, which is a wired remote control to fire your cameras shutter without having to physically push on the camera body. 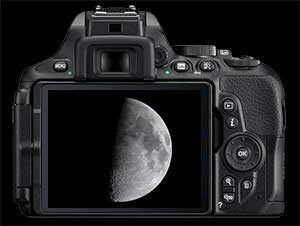 When taking an image of the Moon with a telephoto lens, most of the standard rules of photography are still in play. Bear in mind though, that there is no depth of field. When you focus on the moon, it is so far away the entire globe will be focused the same. Open your aperture up wide to let in plenty of light. A common misconception is that high ISO adds electronic noise. Usually the added noise is what we call shot noise, and it’s due to the lack of light actually falling on the sensor. Longer exposures with plenty of light will always produce the most noise free images. In terms of exposure, use the histogram display on your camera just like you would a daytime scene. Keep the histogram in the middle for the best contrast and avoid over saturating the brighter areas. You can tell from this histogram when this is happening when your data is getting too close to the right-hand side. If you really want to make an investment, you can use a telescope as a fixed prime focus telephoto lens. 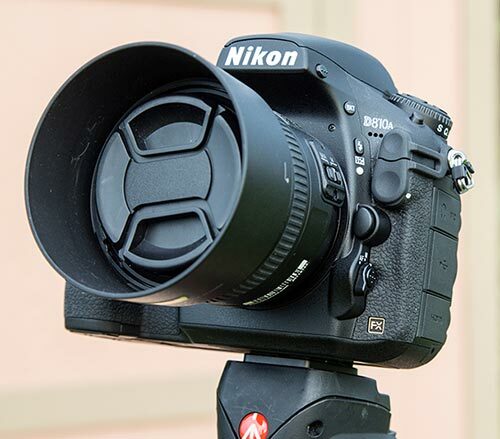 A special adapter will connect your DSLR directly to the back of the telescope in lieu of an eyepiece. When you take this approach, many people are surprised that the cameras auto-focus does not work. Focus is achieved by physically moving the camera back and forth using the manual focuser that comes with every telescope. Looking through the view finder can be tricky when focusing this way. A better approach is to use the live view/video mode of the camera to display the current image on the back LCD. If you can zoom in on this view, all the better. Zoom in as much as possible and then use this as visual feedback to adjust the focus perfectly. Finally, if you are going to get this up close and personal to the Moon, I would encourage you to learn more about it. 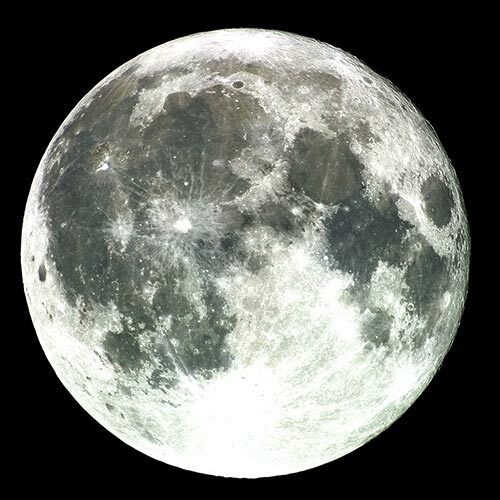 There’s are thousands of people around the world who study and photograph the Moon on a nightly basis! Google your local astronomy club and get involved or check out The Association of Lunar & Planetary Observers on line! (http://alpo-astronomy.org/).